Participants traveled from all over the California, Arizona and Nevada to attend the 5th Annual “iCAN TRI” Triathlon, held July 17th at Clovis North Educational Center. This year’s event was host to USAT Southwest Regional Youth Championship and F1 draft-legal developmental race. This year also introduced the adult divisions, Sprint and Super Sprint races. The swim was staged in the Clovis North Aquatics Swim Complex using the two 50-meter side-by-side long course pools. The closed bike courses of 2, 4, 8 and 10 mile were safe, well-marked, and challenging. The point-to-point run courses of varying distances challenged athletes in the 4 youth age divisions as well as the adults. All divisions were color coded and courses were color marked for each age division. This venue is easily navigated for parents and very spectator friendly. The transition and finish line were staged in such a manner that spectators had a virtual 360-degree view of the event. 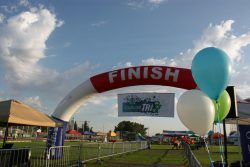 iCAN Junior Triathlon Club hosted the event, bringing its vibrant flavor to the race, evidenced by the bright green and blue club colors spread across the venue. This was synchronized with the spectacular finish line and “community village” complete with a buzzing EXPO that included water slides, free food, and cold water. The event returned a broad range of community businesses to the race with an EXPO that was the center of the “community village”. Local cycling teams, triathlon clubs, swim instructors, medical doctors and nurses stepped up to lend a helping hand to an event that covers a large amount of territory. Safety is always the Race Directors main focus. Both State of California, CHP and City of Fresno PD officers patrolled the bike course to ensure safety and adherence to traffic closures. A fully staffed medical station was set up to provide assistance if it was needed. Local Cycling Team members from the community volunteered to help on the bike course and lend encouragement to the younger participants. All-in-all, the volunteers help make this an unforgettable event. In 2011, USA Triathlon recognized iCAN Junior Triathlon Club as one of the top three youth clubs in the nation.